Traveliztera: Randomly Entertaining! 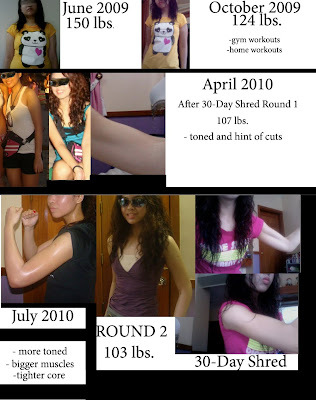 : 30-Day Shred Results: Round 2 ! | Weightloss Journey Ends From 150 lbs. to 103 Lbs. 30-Day Shred Results: Round 2 ! | Weightloss Journey Ends From 150 lbs. to 103 Lbs. After gaining 4lbs. when I arrived from a trip last June, I decided to start another round of the 30-Day Shred because I wanted to drop my weight from 111 lbs. to 107lbs. If you checked out my 1st entry regarding my 30-day shred results ( 30-Day Shred Weightloss Results: Round 1 ), I lost 7lbs. This time around, I lost 8lbs. Basically, my current weight is 103 lbs. Now I know that we were given the promise of losing UP TO 20 LBS., but once again, I'll defend Jillian Michaels with regards to the issue of the others who did not lose that much--like me. Keep in mind that even though you may have lost a lot of FAT WEIGHT, you may have also gained a lot of MUSCLE WEIGHT (and muscles are heavier compared to fat). In the end, it would seem like you just lost a few pounds but in reality, you lost a lot of fat weight and you just became heavier due to your muscle development. Despite these results, everytime I flex my muscles, they're really prominent and everyone notices them. Compared to my first round, the results are much better now. Here are some pics from June 2009 to July 2010. I started with a weight of 150 lbs. and for 3 months, I worked out at the gym with my trainer while I took care of my own diet. After 3 months, I was on my own. I made use of the different workouts found in the Women's Health magazines, as well as workout books and articles. After 2 months of being my own trainer, I decided to do the SHRED for 1 month and I finished it last February. Now that it has been a year since I started my weightloss journey, I'm happy to announce that I've lost 47 lbs. and the last round of the Shred helped me boost up that weightloss (I've had a lot of plateaus so I needed a break and the Shred became my jumpstart). 45 Travelers with Comments. Click to comment! whoa! congratulations! big loser ka! JOHN - unfortunately, i'm not in love haha! balitaan kita kung nainlove na haha! Interesting! Yes, being busy is not an excuse. I would love to try it. WAIT - o sige WAIT nalang tawag ko syo haha! syempre, i know ur names! haha! ANTHONY - glad to have inspired you :) TC! stephie, bagona din kasi ang aking number. hahaha. email mo sa akin number mo sa popoyinosentes@gmail.com OK? That's amazing that you did so well on your own. I feel like I rely a lot on my trainer and worry that I don't push myself hard enough on my own. Karen - Hi Karen! Thank you! You look great as well! :) I actually miss having a trainer because there are times wherein I feel so lazy and I'm not doing the right positions anymore and I feel like I'm no longer exerting a lot of effort... Since I stopped having a trainer with me, I got myself this dvd and it's hard to not follow Jillian Michael cos she's such a huge motivator haha! Well she's bossy and that's an okay motivator but her body motivates me more! Ekstranghero - Have funnnnnnn! Hahaha! It has been almost 8 months since I last went to the gym, BUT guess what? A big part of me feels that the gym is over-rated and it's highway robbery .. because losing weight, being fit, and staying fit are all about us: lifestyle, discipline, etc. Favorite ko yung panda, hahaha! Post 30-Day Shred, are you on Insanity now? that's true! and sometimes, you waste an awful lot of time cos u still need to prepare and go to your gym... It's one of the reasons why people get lazy. =( You can actually lose weight in everything u do... U just gotta choose which are beneficial... :) Hahaha! Yeah, the panda lost weight too! What were you eating the whole? hanep! nakakainspire! seseryosohin ko na nga rin yung aken. yung panda mo pumayat. sana yung hippo ko pumayat din. lol! arhey - OA naman ! hindi naman ganyan! nakahiram ako ng dvd sa friend ko. grabe kalahati pa lang ng level one pagod na pagod na ako... pero kaya to! =D ang hippo ko sesexy! hehe..
congrats. amazing result.di talaga madaling gawin yan. nakakainspire. wow killian michaels really do work! i should ge ta copy and see how it does to my body! lol.